Ronnie Martin grew up in Fort Worth, where his father was a band director in several area schools. Ronnie’s education includes a Bachelor of Music Education and a Master of Education Administration from TCU and he completed all but his dissertation toward a Doctor of Educational Leadership degree at UNT. While at TCU he sat first chair trumpet in the marching and symphonic bands. He played lead trumpet in the stage band and principal trumpet in the TCU Symphony Orchestra. As a freshman at TCU, he began playing in the Fort Worth Opera Orchestra. Shortly thereafter, he was principal trumpet in the newly formed Fort Worth Symphony Orchestra. He continued to play principal and section trumpet in the Fort Worth Symphony and the Fort Worth Opera Orchestra for ten years. In his sophomore year, he became the first band director in Burleson ISD for one year and in his junior year he became the band director in Azle ISD for three years. After graduation he became the Band and Orchestra Director at Eastern Hills High School in Fort Worth. Between his sophomore and junior years, he toured with the Ted Weems Orchestra as lead trumpet for the summer (John Giordano was playing lead alto sax at the same time.) and he toured with the Tex Beneke Orchestra during the Christmas break. His senior year he played a short tour as lead trumpet with the Ralph Marterie Orchestra. Later he toured with the Les Elgart Orchestra. 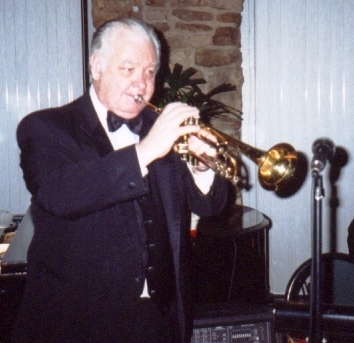 He has played lead trumpet in most local bands and orchestras in the Fort Worth/Dallas area. He also played lead trumpet in the Miss Texas Pageant Orchestra, Shrine Circus Band, Southwestern Exposition Stockshow Rodeo Band and back-up orchestras for Steve Lawrence and Eddye Gorme, Pat Boone, Carmon Cavalero, Bob Crosby, Charlie Applewhite, The DeCastro Sisters, Bob Newhart, Herb Shriner, Sally Rand, Betty Buckley and Ray Price. He formed the Ronnie Martin Orchestra in 1970’s and has played in all of the area country clubs, hotels and ballrooms. He has written over one thousand arrangements for his own Ronnie Martin Orchestra.